Whether your Holiday Season has ended or is about to begin, summer camp season isn’t far away! In fact, on December 8th 2010, next year’s campers wore their camp shirts in numerous cities to mark the 200 Day Countdown To Summer. If you’ve never gone to camp, it may be difficult to understand what drives this passion for camp all year—but campers know that camp is contagious, FUN, and essential! The camp experience helps children develop into well-rounded adults in enormous and complex ways, and that’s really important—but having FUN and intense youthful experiences is how it all happens. That’s the brilliant combination of camp. The experience includes serious AND hilarious moments—often simultaneously! The whole experience is much like the two sides of a single coin, or the double-faced image of Janus, the Roman god who can see into the past and future at the same time—and the origin of the name for the first month—January. The serious side of camp includes feeling part of a unique community, identity development and participating through the years to make irreplaceable memories. If you don’t understand why camp is such an important American institution, in 1998 Ira Glass and the This American Life radio program attempted to investigate the topic—#109 Notes on Camp. The program addresses why people who love camp say that non-camp people simply don’t understand what’s so amazing about camp and attempts to bridge the gap of misunderstanding between camp people and non-camp people! 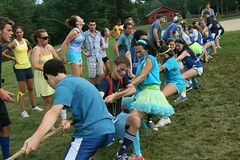 It also highlights how fun, tradition, stories, community and being human are all part of identity development at camp. With his signature quirky style, Ira assembled more “truth is stranger than fiction tales,” where real campers tell stories of camp in days gone by and explain why the camp experience is so special. Hundreds of campers responded to his call for stories and the program shares a selection, so if you’re interested in history and interpreting American culture, you’ll find the reminiscences fascinating. Just remember that all camp experiences are not like the stories told—the point of the program is to illustrate the intensity of the experience! It ends with campers talking about becoming camp alumni and how their camp experiences won’t ever be forgotten. As we all know, time passes and our camp years are limited by the fact that we’re only children once. It’s easy to feel briefly melancholy at year’s end as time waits for no one, but of course, December also means that the promise of a new year is around the corner! In January, we’d like to continue looking backwards and forwards while thinking about camp and we’d especially love to hear from camp alumni. What’s the funniest thing that happened to you at camp? How did camp contribute to your adult life? We’d like to hear about the memories you hold dear and close to your heart, or what you wish for campers next year? If you’re counting the days until camp starts, what are YOU planning? For now, “Happy New Year” to everyone and let the countdown to Camp 2011 begin! Thanks for the images quinn.anya and megawheel360. This entry was posted in Uncategorized and tagged benefits of camp, camp for kids, camper stories, summer camp 2011, summer camp traditions on January 18, 2011 by Camp Laurel South.